Council 4442, under the direction of Brother Joe Stafford and the Scholarship Committee, is pleased to support the young people within our council family who strive to enhance their education at the college/university level. Please contact Brother Joe Stafford, Scholarship Committee Chairman, at 603.893.6003, or click on this link for EMAIL to the scholarship chairman for any questions or concerns. Applications must be mailed and postmarked by July 1. Click here for the current College Scholarship Award Application and full details of eligibility. The 2018 Family Day Picnic and Scholarship Drawing will be held on July 29. Twenty awards will be given out. Also, awards for the TAPS program will be announced. The TAPS form is available for the current year. Any questions? Contact the TAPS chairman, Mike Petrilli, at 603-893.4784 or click HERE to send an email to the TAPS program chairman. Applications must be mailed and postmarked by July 15. Council 4442's Family Day Picnic, TAPs and Scholarship Drawing was held on July 30, 2017 and attended by approximately 90 members, family and friends. The weather was outstanding, no one complaint (I didn't hear any). The preparation started on Saturday, July 29th, with setting up the tents, tables and chairs, cleaning the grills, and purchasing of the food. We also purchased 2 LP 20 pound tanks, in as much as all but one of our five had expired. A special tanks to Butch Kealey and Bill Richards for being one of the first in on Sunday morning to start the food preparation. Also, a special thanks to Chanel Simard and Dennis Coleman for grilling/cooking outside under the tents. Father Bill blessed us with his presence and offered the opening prayer. The food lasted, with extra/leftovers to spare. 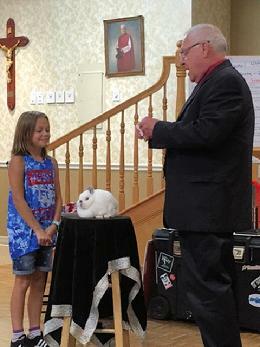 The Magic Show ($200.00) was performed by Peter Jackson featuring a Magic Bunny. Three children attended and had a great time. TAPs (Tuition Assistance Program): The following families received $500.00 for Parochial School assistance: The Bufagna family, the Norris family and the Quinn Family. Thanks to Mike Petrilli who is our TAPS chairman. Scholarship Drawing: There were 37 qualified applicants. There were a total of sixteen $750.00 scholarships. The sixteen $750.00 Scholarship awardees are: , Noah Thompson, Tristan Beaulieu, Sarah Richards , Heather Alfano, Michael Pappas, Andrew Masciarelli, Fiona Lapierre, Kyle Faucher, Gabrielle Defeo, Kelsey Norris, Dawson Shyne, Kaitlyn Miele, Serena Uliano, Christopher Houde, Dean Coletti, Julia Collopy.